The Spa-Me by Website is absolutely awesome! It is perfect for anyone who needs to relax, feel a little better or even just treat themselves! We have used ours for so many things! Helping to relax a sick baby, soothing headaches, and even helping rid ourselves of muscle cramps! You can also put a few drops of your favorite essential oil on it before heating so that you can inhale those relaxing smells as you allow yourself to rejuvenate! Also, we have found use for it with our furbabies as well! Since you can wash it, it’s great for everyone! I had the privilege of reviewing the Spa Me Hot or Cold pack in exchange for this review and have loved it! I will never sell out my opinions, so know that the thoughts on my site, here and otherwise, are always my own! We all have those days where a heating pad or cooling pack could do us some major benefits, and now our lovies can have the equal to human pleasure! Not only is it beneficial but the sweet little puppy printed fabric melts my heart. Seriously “Warmables” are super H.O.T. Hot! 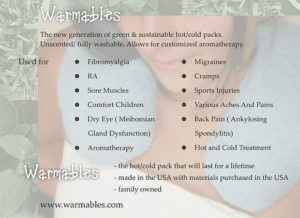 I love that Warmables are made in the USA and that their price includes shipping! I wish more companies would do it that way! 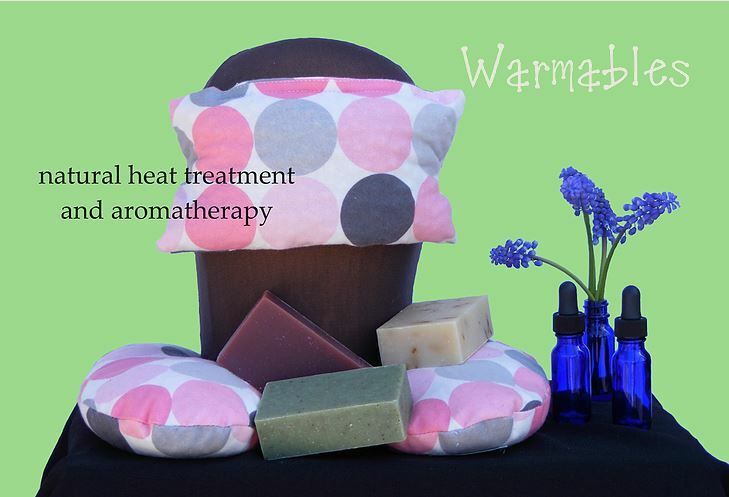 In addition to the Spa Me, Warmables has many other fabulous products! Like lunch kits, eye masks, foot warmers, and even hot/cold packs for expectant moms! 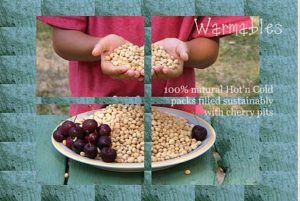 Whether for yourself or as a gift, Warmables has just the right products to help ourselves out without harming the environment! ← Groupon Coupons! Get your Big G Savings On!!! This product sounds amazing. 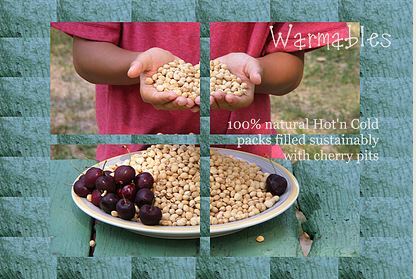 I can not believe that cherry pits were this versatile- and to think I just throw them out. Between the numerous uses, products, and the fact you can customize them to your favorite aromatherapy scents, I am not sure what I most impressed by.